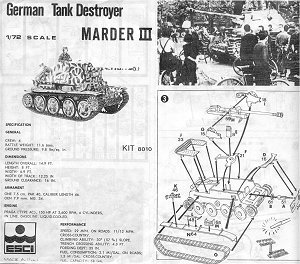 Many of you are already aware that the three Marder series of vehicles were an interim solution to getting mobile anti-tank forces to the troops as soon as possible. There were over a half dozen variations on different chassis under a common term we use today as Marders (Marten). I remember them by the chassis they were mounted on: Marder III on the Panzer 38(t) chassis (Panzer 38: Marder III, see the connection? ), Marder II on the Panzer II chassis (this one is more obvious); and Marder I on the French Lorraine carrier (okay, one exception!). 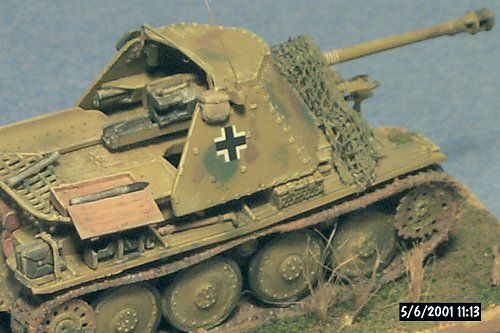 This kit represents an early Marder III mounting the German 7.5-cm Pak 40 anti tank gun. The gun is mounted in a riveted lightly armored superstructure atop a largely unmodified Pz 38(t) tank chassis. These vehicles were out of production by late 1944 having been replaced by the Hetzer. This kit will likely, I hope, be re-released by Italeri soon after being out since 1994 or so. Its interesting that one of my early kits is packaged under Revell Italeri! How things come around full circle? Instructions are good. Decals are water slide decals with German crosses and unit letters. The parts are well molded though a bit thick. 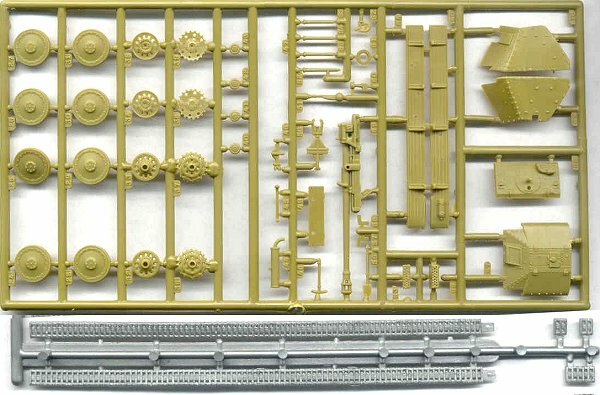 If the kit is released again I hope that PART issues a brass detail set with brass superstructure parts. The tracks with my kit are the abysmal stiff polyethylene plastic material that resists most all glues and tends to crack. It will help if you heat the tracks up in hot water while wrapped around a wood dowel where the tracks will go around the idler and sprocket, then cool in cold water. This should keep them in shape and with more natural sag. My biggest complaint with this kit, is the Pak 40 gun. This is the same gun as in their towed Pak 40 kit. For some reason they molded it in half recoil? This may be cool in an action diorama but would be hard to realistically pull off. To correct this we have a choice of either cutting the gun from the recoil system below and remounting it, or borrowing a Hasegawa or AlBy Pak 40 model. As these vehicles were in service from 1942 till the end in 1945 they can be modeled in either panzer gray or dark-yellow with various camouflage patterns. From photos, unit markings and tactical numbers do not appear to have been common. Overall this is a good kit of one of my favorite vehicles (I am surprised the Attack has not issued any Marder IIIs?). Tracks and other parts from Attacks Pz 38(t) kits may help. PART produces several etched brass sets for the Attack Model kits that I am sure can help with this kit as well. My model above was detailed with a grab-bar above the gun compartment, scratchbuilt ammunition boxes, and I hollowed out the recoil slide under the breach.